It's that time of year again when they send those lovely little Scholastic catalogs home with the children. Now to be perfectly honest, in the four years that my daughter has been attending school this is the first time I have actually ordered any books. Don't get me wrong, I love books, I buy books, but the truth of the matter is that I am frugal. Okay, okay I will say it; I am the Queen of CHEAP! But this year they had some dollar selections which is a price right up my alley. I bought two books for Emily. I bought the classic Charlotte's Web and a National Geographic book called Dog Finds Lost Dolphins. I know, who could resist Charlotte's Web for a dollar; and Emily loves dogs so any book involving one of those great animals is sure to please. 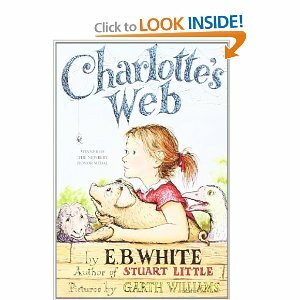 Emily hasn't started reading Charlotte's Web yet, but she has seen the equally famous movie; so I can't wait to see what she thinks of the book. As a child I always loved to compare books and movies and I'm pretty sure the apple hasn't fallen far from the tree where she is concerned. 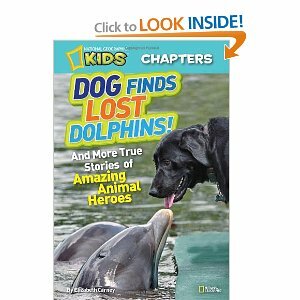 Since neither of us have read Dog Finds Lost Dolphins, it will be fun to explore this book together. And since it is a true story, it should be even more exciting then usual. So what great book bargains have you found lately? As the Queen of Cheapness, I not only love to get a bargain, I love to hear about other people's bargains as well. 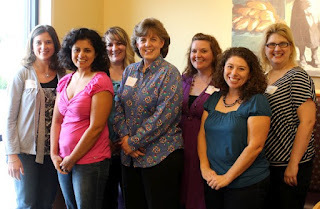 Yesterday I had the pleasure to join six other wonderful moms from around Ohio at the first ever BlogOh event. We met at Columbus which is pretty much smack dab in the center of the state and therefore not too much of a drive for most everyone. Another fun bonus was the fact that we met in the conference room of the local Panera Bread which was another first for this gal. I personally recommend the frozen berry drink! Although I have been blogging for a couple of years now in a sort of hit or miss manner, I thought it would be great fun to attend this blogging event and maybe learn a little something along the way. The first thing I learned was that mom bloggers are way more serious about blogging then I ever imagined. I had no idea the extent of sway a really good mom blogger can have over an audience and I am in awe of the ladies I met. Our organizer, Tonya, writes about her families travels @ her site The Traveling Praters. Jenilee the FaceBook friend who invited me, writes the most interesting antidotes about her family @ her site Our Goodwin Journey. Fellow mom, Stacey, writes a funny blog called I'm A Lazy Mom. Heather, from the Cincinnatti area, is working on starting a fresh blog. And co-bloggers Mona and Valerie blog about what's happening in Columbus on their site Social Moms Around Columbus. Although each attendee and their perspective blogs happen to be very different, what each lady has in common is an enthusiasm and joy for sharing their lives and connecting with others. Blogging takes hours of their time but it is done with such love and talent that the reader probably never takes thought into the effort that goes into each and every post. What I personally came away with from the experience was a group of new friends and a rejuvenated desire to blog and blog well. Not only does blogging help me connect with potential fans for my book, Fern Valley, but it also helps me to continue to perfect my writing. And if someone gets a chuckle out of something I say, finds a book worth reading, or a finds some useful tips to help them in their own writing journey, then that's just icing on the cake.